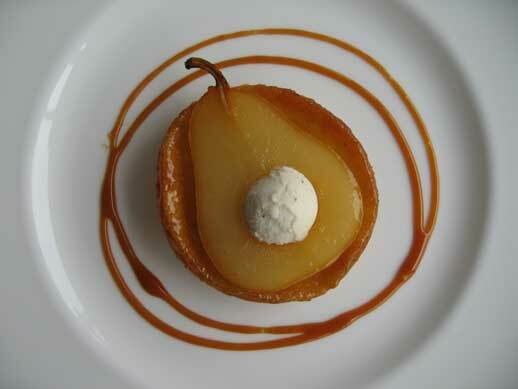 A few years ago I learned how to make this delicious pear tart during a stage at Bishop’s restaurant in Vancouver. The stage was under pastry chefs Dawne Gourley and Lisa Miki. For many years Bishop’s, which emphasizes seasonal, local and organic produce, has been one of Vancouver’s top restaurants. I was impressed by Bishop’s warm refined atmosphere, personable service and lovely high quality food. During my stage, Dawne and Lisa, who I highly respect as pastry chefs, were wonderful teachers and mentors. Bishop’s pear tart, which is simple but spectacular, is a variation on the traditional tarte tatin made with apples. Cornmeal pastry is used rather than puff pastry to make single-serving tart shells. The pastry forms over the shape of the pear, creating a form-fitting shell. I used ripe organic pears and organic cornmeal, but regular pears and cornmeal work just fine. 2. Combine flour, cornmeal, sugar and salt in a bowl. Cut butter into small pieces and work into flour mixture until the texture becomes mealy. 3. Add water and stir until just combined. 4. Cover with plastic wrap and allow it to rest in the refrigerator to 20 minutes. 5. Roll out the dough on a lightly floured surface and cut out six, 3.5 – 4 inch circles. 1. Make a caramel by combining sugar and butter in a saucepan on medium heat; cook until golden, 3 – 4 minutes. Pour approximately 2 Tbsp/30ml of caramel into six small tart sized pans. 2. Peel, halve and core pears. 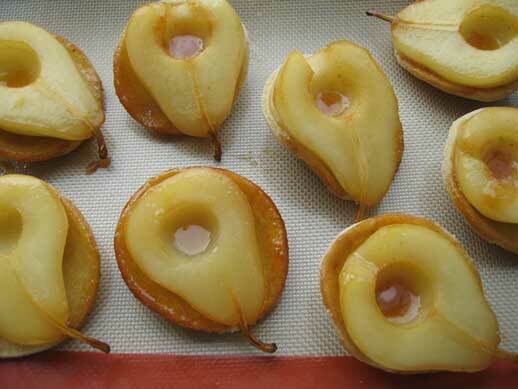 Place a half pear, cored sized down, on top of the caramel in each pan. Take the pastry round and place it on top of each half pear, pressing down around it to follow the shape of the fruit. 3. Bake in the oven until pastry is golden and pear is cooked through, about 20 minutes. Remove from the oven and allow it to rest for 5 minutes. 4. To serve, invert the tarts onto individual plates. The tarts can be made a few hours ahead of time and can be rested in the refrigerator. When you are ready, simply heat pears in the oven till warm and then serve. The tarts are lovely served with the remainder of the leftover caramel in the tart pans, with caramel sauce and with vanilla bean ice cream! I hope you enjoy making and eating these I much as I do. Posted by Sam at 11:46 a.m.
Those are just beautiful. You know the pear has never been a favourite fruit of mine. But lately I keep getting the feeling that baking them somehow transforms them. I must give this a try. Out of curiosity, could I also use apples? They taste better than they look. Cheers. The other day when I made this dessert, two people who didn't like pears, changed their minds after trying it. I think it has something to do with tender pears, pastry and caramel. Apples could be used, but the baking time would be longer. If you are using apples, I would suggest making a classic apple tarte tatin. i love pears and i love tarts ;) they're so well done i feel like i'm drooling over modern art. sam, the pear is most definitely one of my favourite fruits, in both sweet and savoury dishes. These tarts look wonderful, especially with the drizzle of caramel and a little scoop of vanilla ice cream. I love modern art. In fact, I'm in New York this weekend and I am going to the MOMA today! Thanks for your lovely comment. Pears are one of my favourite fruits too Rob, they are very versatile. I bought the Anthony Bourdain video on Ferran Adria and I thought about you and your pea ravioli. I'm still talking to people about that great post! Thanks for your comments. Cheers!